Bon Vivant and a Budget: Free November Movies! Happy November! I can't believe we're this close to the end of the year already! 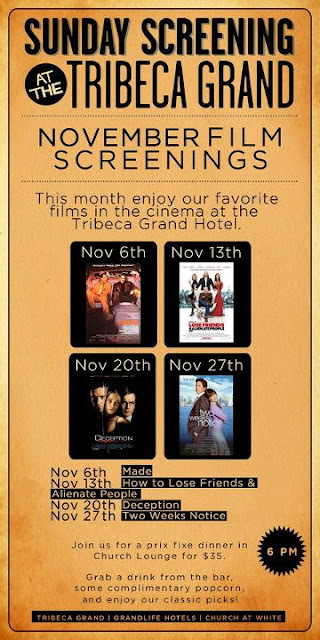 As we've grown accustomed to, the Tribeca Grand Theater in downtown Manhattan is screening FREE classic movies each Sunday during the month of November. Movies start at 6pm, are 100% FREE and come with FREE popcorn to enjoy as well. Perfect for Bon Vivant + a Budget readers, cheapskates and recessionistas alike. Get there a few minutes early for the best seats. Tribeca Grand Hotel is located @ 2 Avenue of the Americas in NYC.